As we settled into our outside table with a bottle of wine, a singing troupe – all ankle bracelets and Arabian pantaloons – and an assortment of mini-me tots arrived. Tables were pushed together to accommodate them. The children were a delight, running around and playing a game of dashing up to a flyer pasted on the wall (promoting the night’s entertainment, a belly-dancer) and rushing off somewhere inside the restaurant. Later they hooked up with other children (as children do) and adults and kids had their own separate, fun-filled evening. The staff clearly found them a delight too, letting them wander behind the bar, getting them glasses of water and throwing in the odd cuddle. And not a tantrum all night -– even from the children. 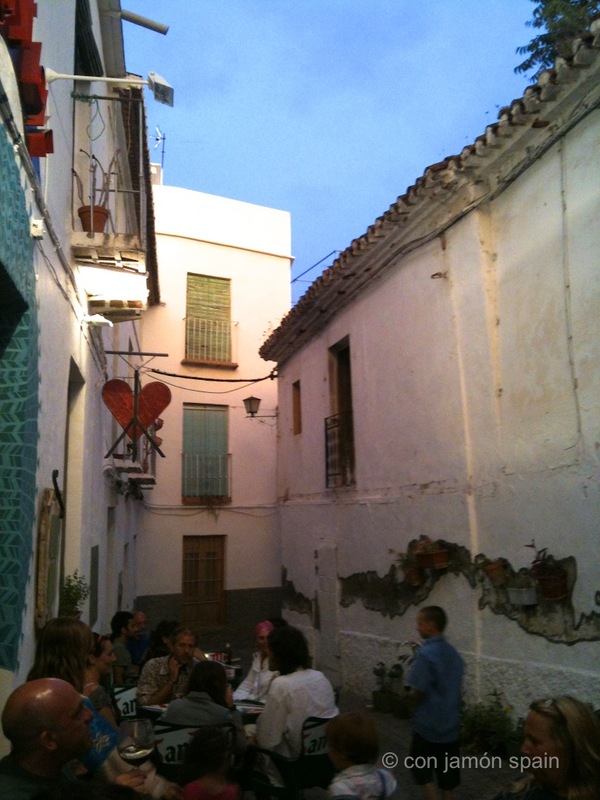 This great little restaurant, on a back street near the old Ayuntamiento (town hall), is a real find. On a wall opposite, the owners encourage people to bring plants to decorate the street. And they have, with dozens of plants lining the wall of an abandoned building. There’s a mix of diners, mainly Spaniards, from youngsters on a date to old ladies who’ve left their shopping trolleys at home – plus a few holiday makers. Inside there’s a bar with a large pizza oven dominating one corner and several tables and chairs with cushions creating a cosy, hippy-ish vibe. We were going to share a pizza but looking at other diners tucking into theirs, greed got the better of us. We ordered a Nepolatina (anchovies, olives, capers and cherry tomatoes) with added mozzarella (probably sacrilegious, but hey, we like cheesy pizzas), and a Samba Pa Ti (mozzerella, Serrano ham, rocket, cherry tomatoes and large shavings of Parmaggio cheese). And they were both utterly delicious. The Nepolatina had a lovely saltiness and the Samba Pa Ti a freshness of rocket and just-sliced ham. We moved inside to get a good spot for the belly-dancing and ordered a tiramisu -– with just the one spoon – for S. Lots of lovely chocolate sauce and mascarpone and a good-sized helping. The belly-dancing was great – a taste of Arabian Nights – and the lovely dancer had a troupe of adoring girls (aged from 2 to 8) copying her every move and following her around the restaurant. She wobbled her wobbly bits accompanied by a drummer and clapping audience. The girls followed her into the ladies for her costume changes and crammed onto her table as she enjoyed a meal at the end of the night – their very-own Arabian princess. 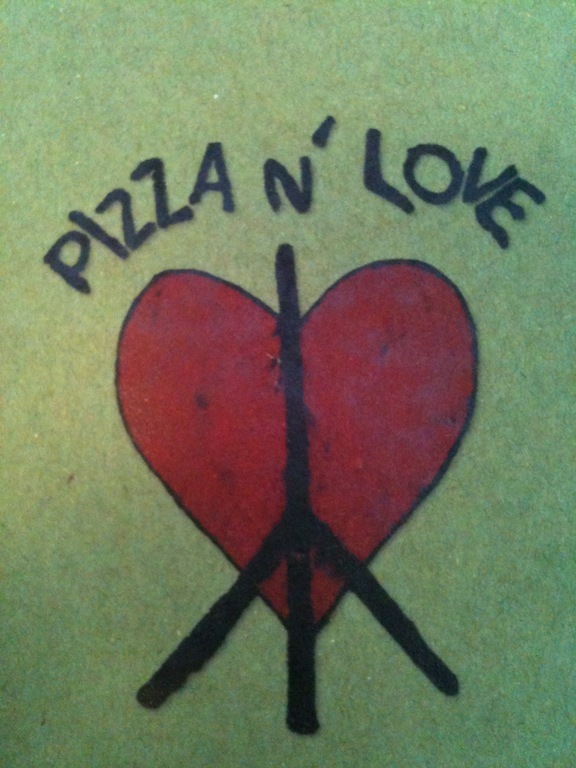 Pizza n’ Love is highly recommended. The staff are great, everyone’s happy and the food is lovely. OK, it’s only pizza – but it’s good pizza. It seems there’s entertainment on most Fridays – there were two flamenco musicians the first time we went. Sample prices: pizzas €8 to €10; salads €6 to €8; tiramisu €5; glass of (decent) house wine €2.50; bottle of Alhambra 1925 €2.50. Open from 7pm till late. Calle Libertad 36.